Bumie Dada drops the much awaited video to her hit song M.W.W.G (Miracle Working Wonder God) a song she has ministered on many platforms and also one of the featured song in the Exalted compilation album of the best Gospel songs from Nigerians all over the world in 2014. 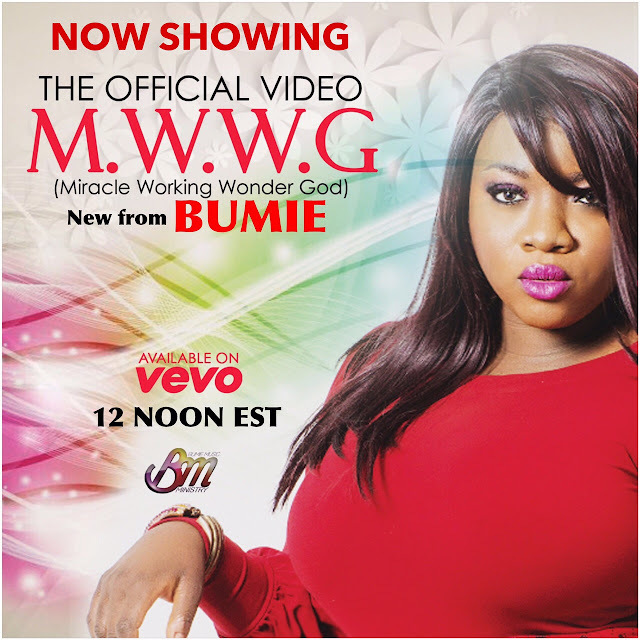 Hear what Bumie has to say about the song “M.W.W.G (Miracle Working Wonder God) has blessed so many lives since its release. The testimonies have come pouring in so we decided to put a face to the message. Every word in this song counts because it is giving all the glory to God for He does miracles and mighty things. There is nothing too hard for God and as you watch this video lay claim to who God is and watch him manifest himself as the M.W.W.G in your life”.